Taiwan has had dramatic improvements in health. 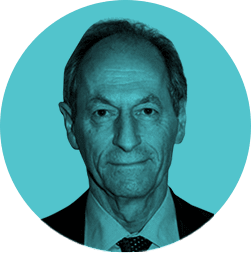 In my view that betokens dramatic improvements in society, along with increased prosperity. A good society will find the route out of poverty as well as caring for those who are disadvantaged in other ways. One way to see this was to visit rural Ilan county, on the coast east of Taiwan. Shu-Ti Chiou has many strings to her bow. She had been health commissioner for Ilan before moving to Taipei. Last year she was prevailed upon to run for mayor in Ilan. She didn’t win, but received campaign expenses proportional to the votes she achieved. She used the money to start a small foundation to promote better health in Ilan. On a Saturday morning we were taken to Yutian elementary school, to be met by the charismatic head teacher. 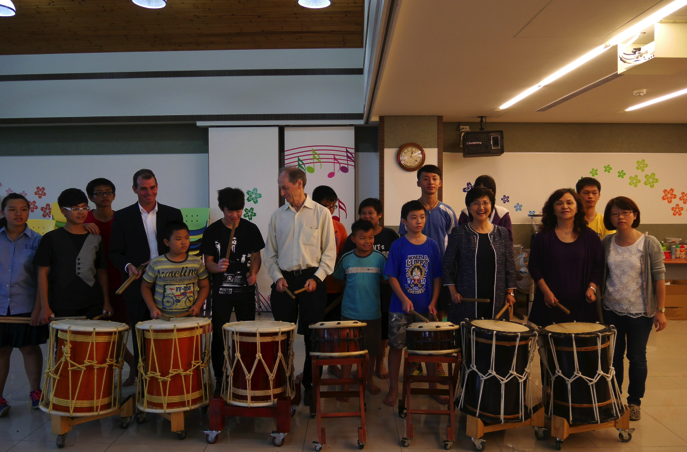 He was clad in cycling gear, because Shu-Ti’s foundation had a collection of school principles set an inspiring example by doing a prolonged cycling trip, ending up at the Eden Foundation Yilan school – see below. Two highlights of the school. First, it might be in a poor rural area, but the head teacher was committed to using technology appropriately. Each child was issued with a tablet computer to use at school and home. It was an integral part of the classroom as well as forming a close link between school and home. Second, after a tour of the lovely school building we had a tea break – no ordinary tea break. Two youngsters performed the Taiwan version of the tea ceremony. I asked if it was modeled on the Japanese tea ceremony and was told firmly: no, the Japanese got it from the Chinese. It really is a wonderful interlude to a busy day. No dunking of a British Rail tea bag into a mug of boiling water and going back to your desk. The student laid out five cups for the four ‘guests’ and herself, then slowly, methodically, and with practiced movements went through the ritual: warming the receptacle – perhaps best described as a porcelain squat jug; putting tea leaves into it, pouring water on, then discarding immediately – apparently this removes dust from the tea, and perhaps some unpleasant taste; then pouring a new lot of water on the leaves; then filling the small cups – which of course are in the same style of porcelain as the jug. All this is accomplished in absolute silence which adds to the meditative quality of it. Fifteen minutes of this and not only have you had a refreshing tea but you feel calmer, more meditative. 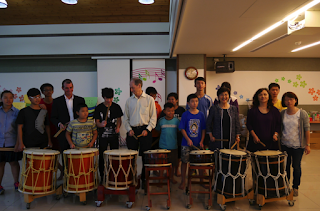 Then onto the Yilan Branch of the Taiwan Fund for Families and Children. Children from disturbed families are brought into the place. If because of their disrupted backgrounds, they are doing badly in school, they will actually attend school on the premises. We were treated to a drumming display by a group of these children who were clearly committed to what they were doing. It is a lovely place. One special area, no shoes, colourful but calming, is where young people can go if they are feeling angry or upset; or where they go with a counsellor. I asked, I would wouldn’t I, if they had any measures of success or otherwise of their various activities. Probably not, but it certainly gives children a place to be, to have fun and/or meaningful activities, and to feel a little bit of love from the warm committed social workers in the place. 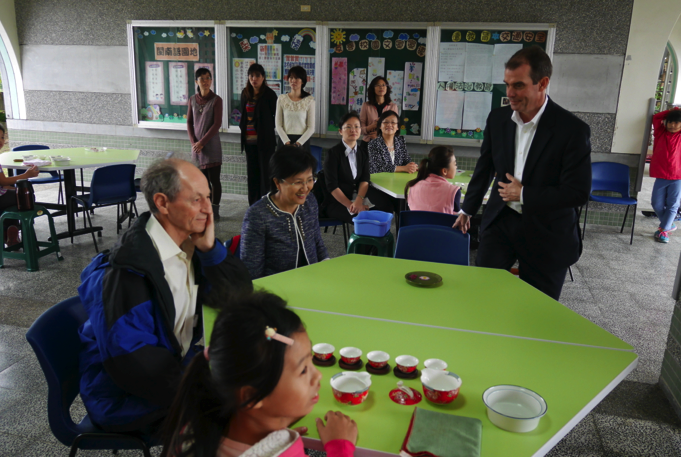 Last stop was the Eden Foundation Yilan School. It is for educationally subnormal children and young adults. As with our previous two stops, the overwhelming feeling was that of staff who cared. The head teachers arrived on their bicycles and put on a concert for the residents, who appeared most appreciative. I don’t know how typical these three special places are of what goes on throughout the country, but if this is how the poor, the disturbed and the mentally subnormal are treated, then the country has a great deal going for it.